Bowie 6 years and a whole lot of hair care products later. The next two years were Bowie-free for me. I had no awareness of what he was doing after “Space Oddity” became a late-in-the-game US hit in 1973 until two years later. I had grown up liking funk music from my early childhood in Los Angeles. KHJ-AM played lots of funky hits like “I Gotcha,” an R+B hit that I loved so much, I asked for a 45 of it for my 7th birthday! What really sent me into orbit as a 2nd grader was the track “Trogledyte” by the Jimmy Castor Bunch. It was funny and very seriously funky. I was a child. I did not respond to the bawdiness of the record; at least on a conscious level. Why I have no childhood memories of James Brown I can’t really account for. He would have been a fave. 1975 first exposed me to Parliament/George Clinton and “Tear The Roof Off The Sucker.” So I was primed for funk by the time of fourth grade! They didn’t play too much of it on the much more conservative airwaves of WLOF-AM in Orlando, Florida. I didn’t know it at the time, but the airwaves were much more segregated where I had move to in 1972. Unless that crossover into pop happened, I was missing out. In 1975, heard a dramatic new song exploding from my radio. No one missed out on this one. It was heavy yet impossibly elegant at the same time as a very, very different David Bowie ruminated on the downsides of fame to a grinding, almost industrial beat. The production was immense. Foghorn synth…bass… to this day I really don’t know what I’m hearing exactly on the number, which still is as compulsive to me now as it was then. It was compulsive enough for a lot of people, since the song made it all the way to the coveted US number one spot on the Billboard charts. It was so compulsive and so funky that James Brown lifted Carlos Alomar’s insanely funky guitar riffs [as in Xeroxed®] for his own “Hot [I Need To Be Loved, Loved, Loved].” How many people can say that James Brown copped their riffs? I was primed for more Bowie, and I didn’t have to wait long. 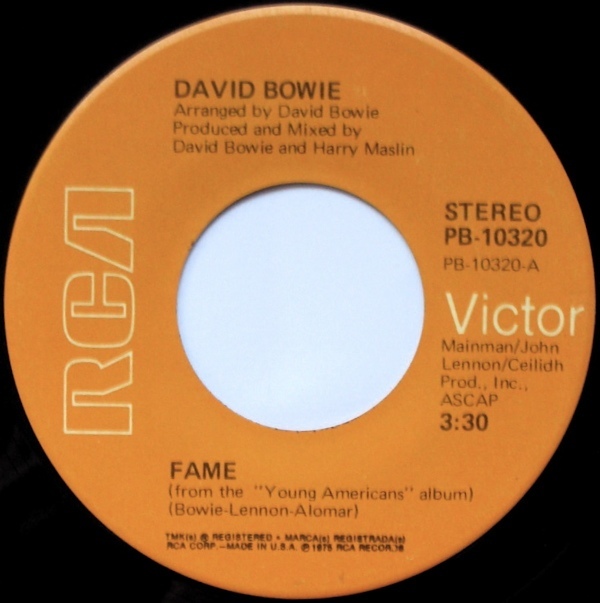 This entry was posted in Bowie, Core Collection and tagged 1975, David Bowie, Fame, Young Americans. Bookmark the permalink. Fame was definition of crossover in the mid 70’s. That it was made by two thoroughly white British men employing the assistance of a group of you Philly soulsters says it all. Sure, I’m not sure how much John Lennon was involved in the sound of Fame, but those lyrics are certainly influenced from his perspective. I was well and truly an avid fan of 12 at this point. EVERYTHING was David Bowie, with smatterings of Elton John and Wings among the records I had either been gifted or saved up to purchase at that point. Bowie, and my cousin also led me to T.Rex by then and they seemed to have some relationship to the Starman, but Marc Bolan didn’t seem as colorful or gigantic to me. But Fame was inescapable on NYC radio. It was AM, FM, Rock, R&B stations nonstop and it was definitely one of the songs of the summer that year. When I started Junior High School that following September, one of my teachers was in charge of the Yearbook Booster club and as a competition to sell booster advertising in the yearbook, students could win prized that included record albums! 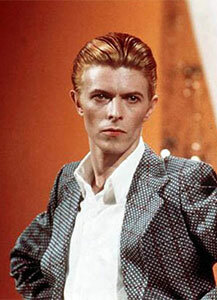 I was a booster selling demon and I filled by Bowie back catalogue by the beginning of 1976 selling them. It was through this collecting of Bowie’s discography that I discovered Pinups and Hunky Dory which are cherished album of those formative years. For years I had no idea what the originals of Friday On My Mind and See Emily Play sounded like. I’ll still take those Bowie takes over the originals, actually. Changes and Andy Warhol remain among my favorite songs of Bowies amazing canon. Echorich – Can’t go there on “Pinups.” The original “See Emily Play” is my favorite burst of psychedelia. Gutted that after 35 years I still don’t have a copy of it! I was spoiled by hearing a mongrel US fake stereo copy of “Piper At The Gates Of Dawn” with “Emily” bolted on up front that rocked my world. That version of the album/single is deemed noon-canonical by EMI and it’s m.i.a. on CD. Sigh. Like you, my first exposure to Bowie would have been the re-released ‘Space Oddity’ but then there was that incredible run of 45s right afterwards from Starman to Diamond Dogs just before he went all funky and it must have been something special for you to discover these when you went back and looked over his career. I hope it was similar to my experiences with R.E.M. as Finest Worksong was my introduction to them; it was really enjoyable and enlightening going back to the earliers IRS albums. JC – how I envy your being exposed to single after single as they came out. In the 70’s the Record Industry in the US was self indulgently living it up in LA and there was more import put on what A&R Directors coke dealers thought was hit music than any regard for what was going on over the Atlantic. Bowie may have had a management machine working for him, but Tony DeFries was ultimately more concerned about lining his own pockets and padding his own reputation than seriously working to break Bowie properly in the U.S. This has a lot to do with why Bowie has always had a great reputation with musicians on the fringe or outside the popular consciousness here in America. JC – Three bands/performers paid me the highest dividends when delving into their back catalogue: David Bowie, Roxy Music, and Simple Minds. In each case, I was exposed to unheard music that was colossal. PPM…..if you only first ‘discovered’ Simple Minds when they had the big breakthrough hit courtesy of the film soundtrack then you did indeed have a treasure trove of great albums from the early days to trawl through. The irony being, ‘Don’t You Forget About Me’ was for many, myself included, the beginning of the end in terms of their creativity and credibility among the indie cognoscenti in Glasgow….not that the boys cared as they were soon laughing all the way to the bank with a whole new audience happy to go along and see them in the bigger and soulless venues. JC – No. I speak of the time I bought the “Sweat In Bullet” 2×7″ and moved backward and forward on the Simple Minds train simultaneously. It was like nothing else I had absorbed. Yes, I was appalled by what came after ” that single” for a good decade. “Street Fighting Years” stands as the worst album by a favorite artist I can name. Great place to start. One of the most underrated singles of the era. I like the idea of you going back and forth on the train simultaneously. It’s a great way to really fall for a singer or band. Not sure if you’ve ever seen this clip…1979 in NYC. JC – Oh yeah! That live OGWT set from Hurrah in NYC was a highlight of DVD1 of “Seen The Lights” which I wasted no time in buying a decade or so ago. Relatively often are the times when I play that set or the Late Night In Concert set from 1982 on DVD2!